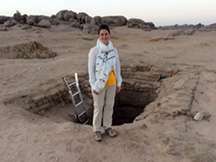 Michele Buzon, a Purdue University associate professor of anthropology, is excavating Nubian burial sites in Tombos, Sudan. A Purdue University archaeologist is excavating in Tombos, Sudan, to answer questions about the Egyptian and Nubian cultures from thousands of years ago. Michele Buzon, an associate professor of anthropology, is excavating Nubian burial sites dated 1500-1050 BCE in the Nile River Valley to better understand the relationship between the Nubians and Egypt's New Kingdom Empire. She is focusing on a time, starting about 1500 BCE, when Egyptians colonized the area to gain access to trade routes on the Nile River. "What is known about this time often comes from Egyptian history, and we think they integrated more than Egyptian texts convey," said Buzon, a bioarchaeologist. "By excavating the burial tombs we'll investigate if there was intermarriage and how they interacted in general as well as if Egyptians absorbed Nubian culture. Artifacts, burial structure and even burial positions will provide some clues." Buzon is excavating at Tombos, in the Nubian Desert in the far north of Sudan, through late February, and she will be excavating Tombos pyramids, which have remnants of the superstructure with shafts underneath. She is collaborating with Stuart Tyson Smith, professor of anthropology at the University of California-Santa Barbara. This is her fifth excavation in the region. This research is funded by the National Science Foundation. A member of the Sudan Department of Antiquities also will be on the research site during the dig. The project, starting with excavation and including data analysis, will last three years. After Buzon returns, her graduate assistants will analyze excavated materials and visit the site for additional fieldwork.